Bannock County 2040 will follow a three-phase project approach. Phase 1, “Gather and Understand” features an in-depth assessment of existing conditions and plans from the County, neighboring jurisdictions and statewide partner agencies. An advisory committee comprised of select members of the public, local agencies and regional partners has been developed. This committee will help inform the planning process throughout the duration of the comprehensive plan update. Phase 1 also features opportunities for the public to participate with this online survey and attend open house events. 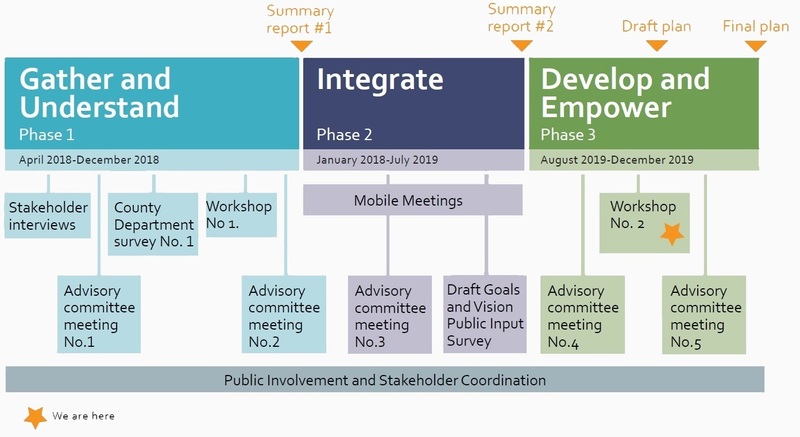 Phase 2 “Integrate” will synthesize the material collected in Phase 1 to create project goals, strategies and a community vision that matches the community’s desires. During phase 2, the project team will develop a revised future land use map, conduct additional community involvement opportunities throughout the county, and continue working with the advisory committee. Phase 3 “Develop and Empower” will finalize the plan incorporating community input, strategic solutions, and long-term goals for the County. The final plan will go out to the public for a final round of review prior to adoption at the end of 2019. Why is a comprehensive plan important? The plan, when adopted, will serve as a tool for positive development and growth in Bannock County. Issues of land development, recreation, community character, housing equity, connectivity, and public health will also be addressed in the final comprehensive plan update.